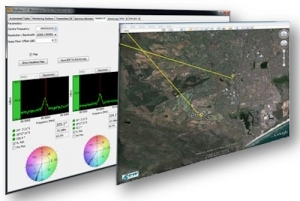 The SkyMon-CC is a powerful and intuitive software package intended for countrywide spectrum monitoring. SkyMon-CC software provides the perfect solution for integrated spectrum monitoring in accordance with ITU-R recommendations. The software is deployed in a national or regional control centre where it is used to perform spectrum monitoring tasks. Remote monitoring stations can be accessed directly or tasked with specific requests. When coupled with a spectrum management system, it provides a fully integrated Spectrum Management and Monitoring Solution. The SkyMon-CC Suite is an integrated software package giving access to remote control of any remote monitoring station or mobile monitoring station. The suite allows for baseline DF, automated and manual tasking of remote stations and offers full control over hardware at these locations. Extensive reporting also forms part of the software suite. Furthermore the SkyMon-CC allows for online and offline tasking of remote stations allowing an operator to collect results in real-time or retrieving results after a task has completed.